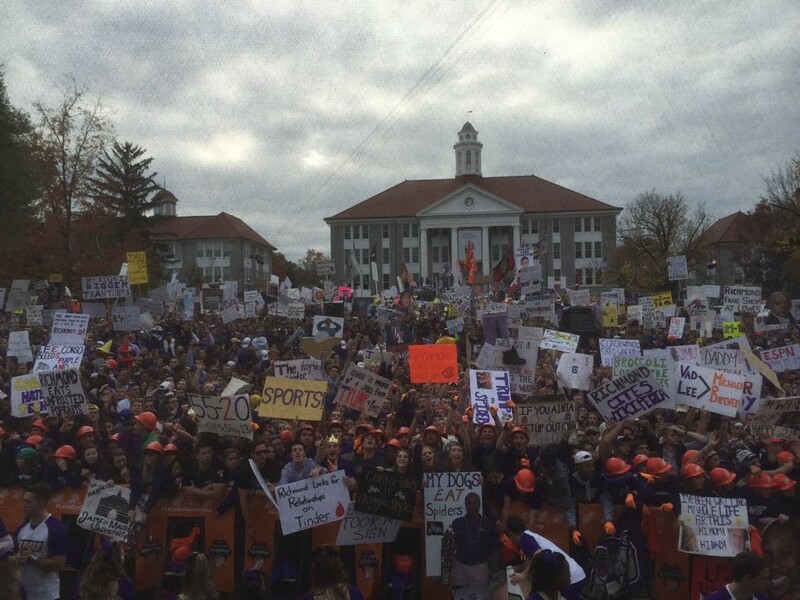 If you had ESPN turned on this past Saturday morning, you may have seen a packed purple and gold Quad…yes, that’s right… ESPN CollegeGameDay came to James Madison University in Harrisonburg, Virginia this past Saturday!!! ed at JMU to the time their semi-trucks officially parked on the Quad earlier last week. Of course, the whole reason JMU was chosen was because of our unstoppable energy this season. Up until last week, JMU was on a 7-0 winning streak (our seventh game we beat Elon 51 to zero). Needless to say, our football team was getting noticed. This was the first time in our history that JMU football has ever been 7-0. 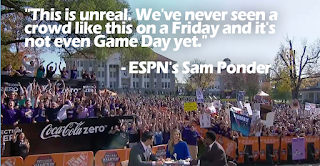 The energy leading up to Saturday morning was literally everywhere on campus from our huge pep really, Purple Out, in our football stadium this past Thursday to students camping out on the Quad Friday night to secure their spot for the ESPN pit for optimal video coverage. I was out of town this weekend due to a family commitment, but come 9am on Saturday morning, I was wearing my JMU hoodie and was ready to watch the ESPN coverage. I turned on the TV and was blown away. 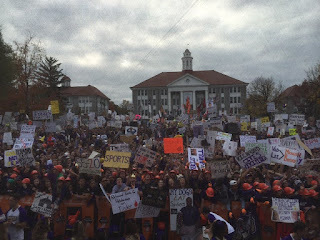 It was reported there was at least 12,000 people on the Quad alone and later that day it was estimated that 26,000 people were at the game (only 20,000 students go to JMU). 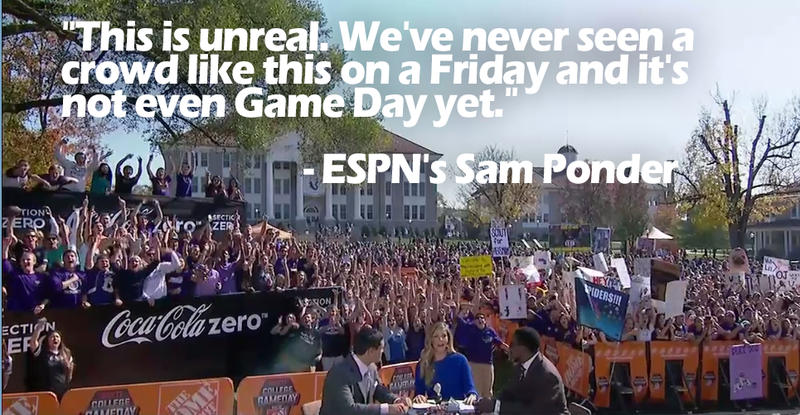 The ESPN broadcasters were equally impressed saying that JMU was the “best crowd they had ever seen for a College Game Day”. I was so proud and impressed that students came together for this game and really showed their school spirit. The coverage was so amazing to watch, like our head coach Everett Withers unveiling the new JMU Football helmets and Lee Corso dressing up as James Madison himself and proclaiming a victory over the Richmond Spiders. The day was so perfect and exciting and the game hadn’t even started yet. At 3pm, everyone flooded into the Bridgeforth Stadium to watch the JMU Dukes play against the Richmond Spiders. The energy and positivity was in the air that no one even considered the possibility that we would lose…but we did. We were tied at halftime, but ended up losing by 10 points to Richmond. It was disappointing sure, but it definitely didn’t ruin the fantastic day that was had by all at JMU! This day was a historic day for our campus and our football team and it’s a memory that thousands of students will get to cherish. After all, it’s not everyday that ESPN comes to your campus J What a great lesson for our students too….Just because the end goal didn’t turn out how you wanted doesn’t mean you cant enjoy the journey. I hope you enjoy the pictures I included. It was genuinely this packed and exciting all day!